Goodbye 2014 - Hello 2015! 2014 is over. Wow. I can't believe it. The year of insanity is complete and a fresh start is staring right at me. As I start putting the pieces in place to make the most of 2014, I can't help but breakdown 2014 and look at where I'm coming from. I would have to say, 2014 has been one of the roughest years in recent memory. For multiple reasons. Its hard to keep hiding behind a smile when you are falling apart on the inside - but that's how I got through 2014. In 2015 - I will make the smile genuine and eliminate the pain and anger inside! 2014 started with Family! But also a sad goodbye. I celebrated the New Year with those closest to me, spent the 1st day with my wonderful family and by the 2nd day of the new year I was driving away from Idaho and back to Washington to start the next chapter of my career and my life with the Caveman. It was just as much of a gamble as it was when we had moved to Idaho in the first place. I don't regret leaving, but I do regret not getting the most out of the time I was there and getting to spend as much time as possible with family I rarely see once a year as it is. 2014 started with a new home! And as we moved into our tiny 2 bedroom apartment, we started making plans for our future. Caveman and I decided it was time to start thinking forward and making changes for a great future. A Fresh outlook for him in regards to school, a new opportunity with my job - it was time to be the adults we knew we were and start living that way. We started making the financial decisions necessary to start saving for our own home. And while we didn't accomplish moving in 2014, we are making the changes needed to soon making owning a home a reality. 2014 started with a devastating loss. By the first week of February, I thought my world was going to end. After many months of trying to get pregnant, I finally had a positive test. The excitement was almost too much. I knew I couldn't call it official until I went to the doctor, but I had plans to go as soon as I could get an appointment scheduled! It took everything I had not to tell everyone at the Super Bowl party we attended - but I didn't. And then that's when it happened. Midway through the 3rd quarter of an amazing football game, I started losing the one thing I had wanted all year. Having a miscarriage at the beginning of the year doesn't really help setup hope for a great year. And outside of writing a blog post about it, I really didn't TALK to anyone about it except the Caveman and 2 of my best friends. Which lead to the middle of 2014. The middle of 2014 was a blur. From my 5 year together-versary with the Caveman (March 2nd) to our 2 year wedding anniversary (August 25th), I felt like I was in a constant state of confusion and blur. While I had celebrations for my 30th Birthday and hung out with some friends, I essentially cut everyone out of my life and focused on just work. I even fell behind in my schooling. It felt like one bad thing happened after another. The events of February constantly sitting on me, preventing me from moving forward, Caveman couldn't get into the school he wanted and had a hard time finding a job, and without any clue why, my step-dad left my mom after 23 years together. I felt like my world was just going to end. The middle of 2014 was frustrating. My cousin got married and for the first time in YEARS, my ENTIRE family was together. All my cousins and aunts and my Grammy and it was great to have them all together. Being able to be with my family was amazing. And with everything going on with my mom, it was great to have everyone around her to support her. I pushed everything I felt to the side and just wanted to celebrate a great event with my family and show my mom that her family is always by her side and we could get through anything. And then another blow - when my little brother told me that I was going to be an aunt - him and his girlfriend were going to have a baby - due the day before my 31st birthday! There was a rush of excitement for them. I was so thrilled to have a new baby in the family and so excited for the two of them to start this great journey together. And then instantly a rush of jealousy and anger. It was supposed to be ME! I'm the one who has worked hard and been trying to have a baby. It was so difficult for me to get over. I felt like I was finally starting to move forward and what should be amazing news, just put me 2 steps back. The middle of 2014 was refreshing. By the end of August, I finally got to take time off from work. I had been so focused on my work all year, working tons of extra hours, that I hadn't gotten any time off. I wound up taking a whole week off at the end of August so that Caveman and I could celebrate our 2-year anniversary and then attend a huge Gaming expo. We booked a couple days in Ocean Shores at a hotel on the beach and headed for a weekend of relaxation. And that's where I recovered. That's where my heart healed and decided to move forward. That's where I realized that I have the one thing other people don't have in their lives - Caveman. Through everything I endured, he never missed a beat and was there for me every second! Happy, Sad, Mad, Teary, Laughing - all of it - he was right there. And all he wanted was for me to be happy. How could I not be happy when I have such an amazing person to share my life with?! I took the rest of the week off I had and started putting goals in place for the rest of 2014 to rebuild. The end of 2014 was rebuilding! After the week off I had at the end of August - I felt rejuvenated. I felt I had everything I needed, I just needed to start small and start rebuilding myself to where I was - and keep moving forward! Caveman finally got into school and secured a much better job. My company took VERY good care of me this year and has made all the sacrifices worth it. My family has never been more supportive of me, and vice versa. I'm finally getting back on track with school and will be graduated by May 2015. I'm getting my health back in order, something that suffered desperately this year. I'm rebuilding friendships I tossed on the back burner for a while. I'm working on bettering myself and organizing my life to make the positive changes I want and need! 2015 will be MY YEAR. I'm on track to make 2015 the most EXPLOSIVELY AWESOME year ever! Caveman and I are taking steps in our careers to secure us for a lifetime. We are taking steps to get a home of our own (no more apartments). And once we get back from a huge vacation in May, we will be taking steps to become parents. I know we will have a family one day, even if it means adopting a child who needs a home. Everything happens for a reason. 2014 needed to happen so that I could find my footing again and hit the road running in 2015! What one word could describe your 2014? What word will you use to set your intentions for next year? No better way to describe it. So many changes with school, with work, with my family. Its really been a chaotic year. I stepped into a new role at work and its been one adventure after another as I've grown and learned so many new skills. I've adapted to the added responsibilities, but still trying to adapt to the added stresses. School has been a blur. Its been difficult to find the time to sit and study when I feel like I've been so on the go with work. So many hours extra each week of work, take away from the hours I have to study. Its difficult to organize time when I'm so focused on work. There are some major positives that have come from that, but I'm not proud of the negatives. Particularly the fact that I had to push off my graduation by 6 months. But I'll get to end soon! In addition to my own schooling, after trying ALL YEAR to get accepted, my husband started a 2 year program this fall for his own degree. I am so incredibly proud of him and progress he's made. Its added an extra schedule challenge to navigate, but we are working through it and starting to find our rhythm. Next year, all the best intentions will be made to make the year Adventurous! Next year, Caveman and I will take a 10 day vacation to Florida for tons of fun, and will also be saving all our pennies for moving to a house. We are so excited to find a place of our OWN - no longer being in apartments, but finding a home that we can call ours and have a yard for our pups. I can't wait for the adventure to come in 2015! The alarm goes off, the dog starts whining, and eyes struggle to open... that's the start of my day. My day can't start unless the puppies are trying to keep me snuggled in bed! But once I roll out of bed, its the glass of water and frantic dash to get ready to get out the door! Big tasks at work are the norm. Its never a bunch of small things to do, its tons of big tasks that need lots of attention and lots of work. But I don't start until I have a hiding session! Never fails, whenever a big project starts, I find a focus room at work, shut the shades, and sit with just my thoughts and a blank page and detail out the project. Its the only way for my mind to stay focused throughout the duration of the project. Finishing tasks is the same every time - Celebratory lunch and drinks! Nothing feels better about finishing a huge project, then getting all the players together to let off steam, talk about the successes, bond together, and then jump right into the next task! Next year, rituals are going to take up my day. I feel the only way to bring organization to my chaotic days is to start mapping it out from the minute I open my eyes to the minute I close them. One thing I realize thought, and that I am conditioning my mind to remember, is that if things don't go 100% the way I want - its okay. there will be detours, there will be different paths taken, but at least if I've planned from the beginning, I've taken an effort to direct my day in a positive manner! Please post your favorite picture of yourself from 2014, self-portrait or otherwise! 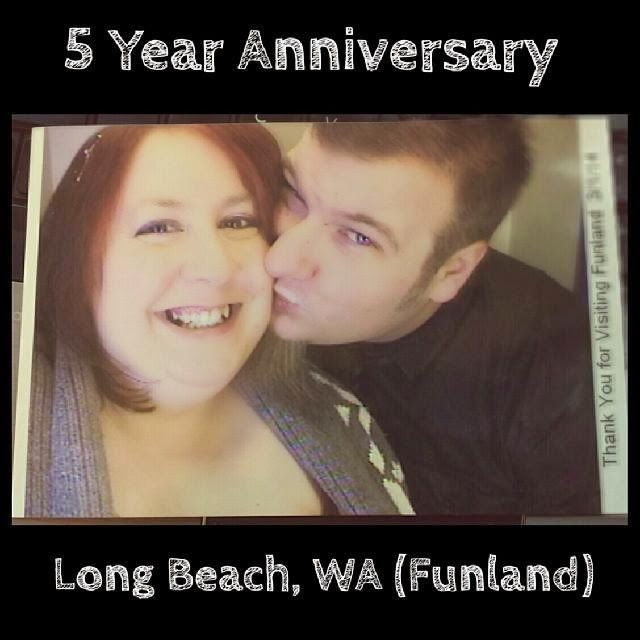 Celebrated 5 years with this man! My favorite pic of the year. nothing makes my life better than knowing he's beside me all the time! What didn’t you do this year because you were too scared, afraid, unsure? Are you going to do it next year? Or maybe you don’t want to anymore? There are a lot of things I didn't do this year that I wanted to - but none of them were because I was too scared, afraid, or unsure. I wanted to have my degree finished this year - but the responsibilities of my work didn't leave me much time. The benefit is that I'm applying what I'm learning to work and reaping the career benefits. Just means I'll have to finish early next year! Of all the things on my list this year to do, nothing was too important that if it didn't get done, the world would end. I will say that next year, I will have a plan to tackle financial and personal tasks that I DO want to complete IN 2015! Catch me in your Inbox! Copyright © 2012 Holly Hindmarsh. Powered by Blogger.